Peterborough Sports striker Karl Gibbs shoots at goal against Peterborough Northern Star. Photo: David Lowndes. This was perhaps the least surprising ‘surprise’ of the United Counties League season so far. 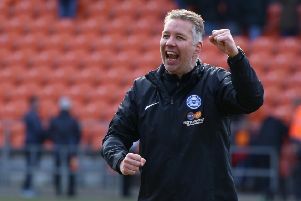 Peterborough Sports might have started the League Cup second round tie 16 rungs below city rivals Peterborough Northern Star in the Football League ladder, but few grassroots experts expected any other result than a handsome home win. If Sports, top of Division One with a perfect playing record, really were undergogs they were rotweilers with a very healthy bite. Star Peterborough Sports striker Avelino Vieira sprints away from the Peterborough Northern Star defence. Photo: David Lowndes. Chairman Tommy Cooper and manager Jimmy Dean have built a squad that will in all probability challenge for the Premier Division title next season. On the evidence of last night (December 1) only goalkeeper Dan George, central defender Luke Smith and busy midfielder Hayden Bream from the Star side would have a chance of breaking into Dean’s starting line-up. Sports didn’t even play that well, particularly in the first-half when there were few signs that any attractive football was about to break out. They were, literally, handed an opening goal on 11 minutes when Star centre-back Chris Hassan, under no pressure from an oppponent, didn’t react quickly enough to a ball that bounced awkwardly off the playing surface giving impressive referee Gavin McFarlane the chance to award a penalty for handball. Lewis Webb confidently stroked the ball home from the spot and it was pretty much plain sailing from there even though Bream rattled the crossbar twice from distance, either side of Sports’ second goal from Jordan Macleod. Star actually started the second-half pretty well as Christian Le also fired just over from long range, but Macleod’s goal, following one of many huge long throws from little Olly Medwynter, knocked the stuffing out of them. Avelino Vieira’s mere presence caused confusion in the Star defence and Macleod, a star Star player last season, netted from 10 yards. Hassan’s bad night continued with the second concession of a penalty and an automatic red card for hauling down Vieira 20 minutes from time. Webb scored again and only two fine saves from George late on kept the final scoreline to 3-0. Star boss Seb Hayes will take comfort from his side’s battling spirit against powerful, experienced opponents, but Dean has much more to look forward to, even after his side have completed the formality of wrapping up the Division One title. Somehow he has persuaded players to perform beneath their natural level for a season at least. Webb, apart from his infantile on-field banter, is a class act at United Counties level. He reads the game well from central midfield and always has time on the ball before picking the right options. Macleod is a bag of tricks on the wing, Josh Sanders and Mark Cox are a pair of dominant central defenders and if you can bring someone of Dan Clements’ quality off the bench you have a squad of rare quality. If Dean can teach the powerful and gifted Vieira the off-side law Sports might even reach an amazing 200 goals for the season - they are now on 121 in all competitions and it’s only just December. Peterborough Sports: Luke McShane, Olly Medwynter, Jack Bloodworth, Josh Sanders, Mark Cox, Lewis Webb (sub Jake Sansby), David Cobb (sub, Dan Clements), Ali Nyang, Avelino Vieira, Karl Gibbs (sub Andy Boome), Jordan Macleod. Unused subs: Matt Cook, Wilkins Makate. Peterborough Northern Star: Dan George, Hayden Bream, Michael Mackrell, Chris Hassan, Luke Smith, Sam Phillips, Jacob Joyce (sub Bobby Bick), Harry Fitzjohn (sub James Hill-Seekings), Declan Rogers, Christian Le (sub Andy Buckle), Callum Madigan. Unused subs: Louie Medwynter, Chris Jones. Goals: Peterborough Sports - Webb (pen, 11 mins & pen 71 mins), Macleod (52 mins). Sending-off: Peterborough Northern Star - Hassan (denying an obvious goal-scoring opportunity. Cautions: Peterborough Sports - Vieira (adopting an aggressive attitude). Peterborough Northern Star - Fitzjohn (foul), Madigan (foul). Elsewhere 10-man Deeping Rangers were beaten 2-1 in the quarter-final of the Lincs Senior Trophy by a Boston Town goal four minutes from time. Jack Cotton was the Deeping man to see red following an incident that led to a Boston penalty in the 32nd minute, but the spot-kick was missed and David Burton-Jones fired the home side ahead two minutes later. Boston levelled from their second spot-kick 10 minutes after the break before grabbing a late winner. Yaxley were beaten 3-0 at home in the Premier Division by Eynesbury so missed the chance to go above Peterborough Northern Star into seventh.